Henry Shelton Sanford (1823-1891) was an American diplomat, lawyer, and businessman. Born in Derby, Connecticut, Sanford eventually joined the United States Diplomatic Corps in 1849. During his initial tenure in the Diplomatic Corps, Sanford served as Secretary of the American Legation at Paris. In 1853, he was promoted to the position of Chargé D'Affaires in France. In 1861, President Lincoln named Sanford as the U.S. Minister to Belgium. During the Civil War, Sanford served as a fiscal agent for the U.S. Government and supervised the U.S. Secret Service in Europe. After his tenure as Minister to Belgium, Sanford played a role in the establishment of the Congo Free State, a vast colony in Equatorial Africa under the direct control of the Belgian King Leopold II. In particular, it was Sanford who lobbied U.S. President Chester A. Arthur to recognize King Leopold's colony, a move that sparked broader international recognition of the Congo Free State. He also served as a delegate for the American Geographical Society at the International African Association Congress established by Leopold II and held in Brussels in 1887. 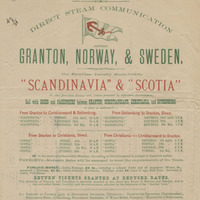 Sanford organized the "Sanford Exploring Expedition," an expedition that served to answer scientific and commercial inquiries in the Congo. Aside from his diplomatic career, Sanford was also a businessman and investor. He made several real estate investments in Florida in the late 1860s and early 1870s, the most notable being the purchase of the "Sanford Grant" in May 1870. The grant encompassed over 20 square miles and provided the basis for the town that eventually bore Sanford's name. Sanford was convinced that Florida would prove a profitable place to invest. 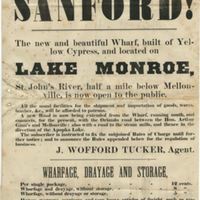 Anticipating significant traffic and commerce by waterway, Sanford bought a land grant positioned on Lake Monroe along the St. Johns River. The city of Sanford thus became deemed the "Gate City of South Florida" - the southernmost stop along the river. During the 1870s, Sanford invested significant amounts of money to the development of his city - he built a wharf, several hotels, a general store, and a sawmill - all of which he hoped would spur investment and growth in the city. Sanford also developed several experimental citrus groves in his Florida city. The first was St. Gertrude's Grove. The second and more successful grove was Belair, developed in the early 1870s. Though Sanford never lived in Florida, he did visit occasionally from the late 1860s until his death in 1891. His diplomatic and business duties kept him preoccupied abroad, and most of his development in Florida was undertaken by representatives and confidants. Following the "Great Freeze" of 1888, Sanford's Belair grove was destroyed. Sanford was committed to rebuilding the grove and, in the late stages of his life, he committed his energies to his Florida investments. He died several years later though, and his wife Gertrude, in an effort to settle debts owed in Europe and elsewhere following his death, sold many of Sanford's properties in Florida. Sanford Accounts Collection, Henry Shelton Sanford Papers Collection, RICHES of Central Florida. William MacKinnon Collection, Henry Shelton Sanford Papers Collection, RICHES of Central Florida. 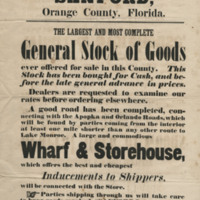 Florida Land Colonization Company Collection, William MacKinnon Collection, Henry Shelton Sanford Papers Collection, RICHES of Central Florida. 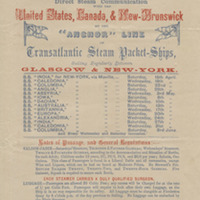 Collection dontated to the Connecticut Historical Society after 1901. Collection loaned to the Tennessee State Library and Archives for processing until June 1, 1960. Collection acquired by the General Henry S. Sanford Memorial Library, Sanford Museum in 1960. The displayed collection items are housed at the General Henry S. Sanford Memorial Library, Sanford Museum in Sanford, Florida. Rights to these items belong to the said institution, and therefore inquiries about items should be directed there. RICHES of Central Florida has obtained permission from the Sanford Museum to display this item for educational purposes only. Molloy, Leo T. Henry Shelton Sanford 1823-1891. A Biography. Derby, CT: Valley Historical Research Committee, 2009. Sanford Historical Society, Inc. Sanford. Charleston, SC: Arcadia Publishing, 2003. Westgate, Philip J., and R. Bruce Ledin. "Belair Groves, Sanford, Pioneer in Sub-Tropical Horticultural Introductions." Florida State Horticultural Society 66 (1953): 184-187.